The Mini Rooter clears lines from rooftop to basement, including kitchen,bath & laundry. 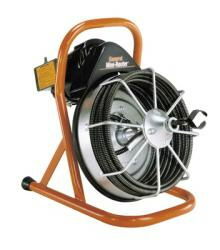 This manual feed snake is easy to use after reviewing its operating instructions and an assortment of cleaning tips will resolve most drain cleaning issues. * Please call us for any questions on our snake mini rooter elec. 1/2x50 foot rentals in Portland OR, Gresham OR, Milwaukee OR, and surrounding metro area.